Eltronicschool. - In this time, we will give you information about the article with the title 'Automotive 3-ph BLDC motor controller with sensorless feedback' that wrote by Graham Prophet. 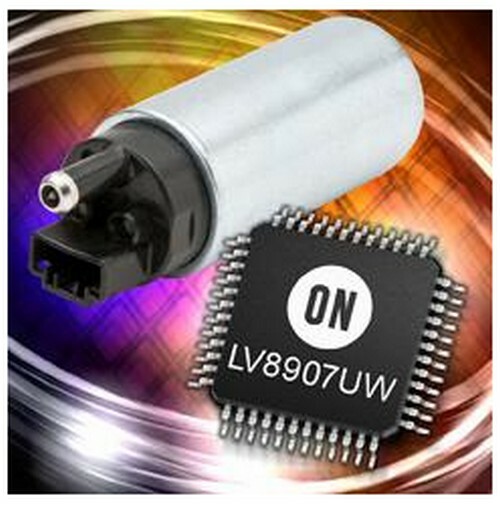 LV8907UW operates over 5.5 to 20V (4.5 to 40V transient), integrates gate drivers for six N-channel MOSFETs, and a dual-stage charge pump for 100% duty-cycle operation. In its lowest cost configuration the IC can operate without an external microcontroller. The device requires no programming, as key parameters and functions - such as startup and speed setting - can be configured via SPI interface and stored in embedded non-volatile (OTP) memory. Open-loop and closed-loop speed control are possible. For more complex applications the LV8907UW can also support a small microcontroller with its integrated linear regulator (3.3V or 5V, 50 mA), a local interconnect network (LIN) transceiver for automotive connectivity, and a watchdog timer. AEC-Q100 qualified, the LV8907UW’s operational temperature range extends to 175°C, for automotive environments. Integrated protection mechanisms include over-current, over-voltage, short circuit, under-voltage, and over-temperature. ON suggests use in automotive water pumps, oil pumps, fuel pumps, HVAC systems, radiator fans, and headlamp cooling units. Now you can read more the article with the title Automotive 3-ph BLDC motor controller with sensorless feedback by Graham Prophet using link here.